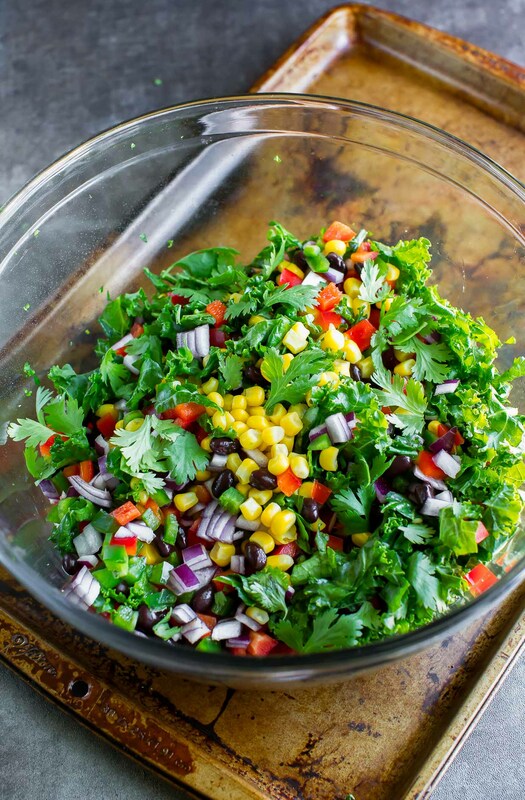 Dive into deliciousness with this Mexican Kale Salad! 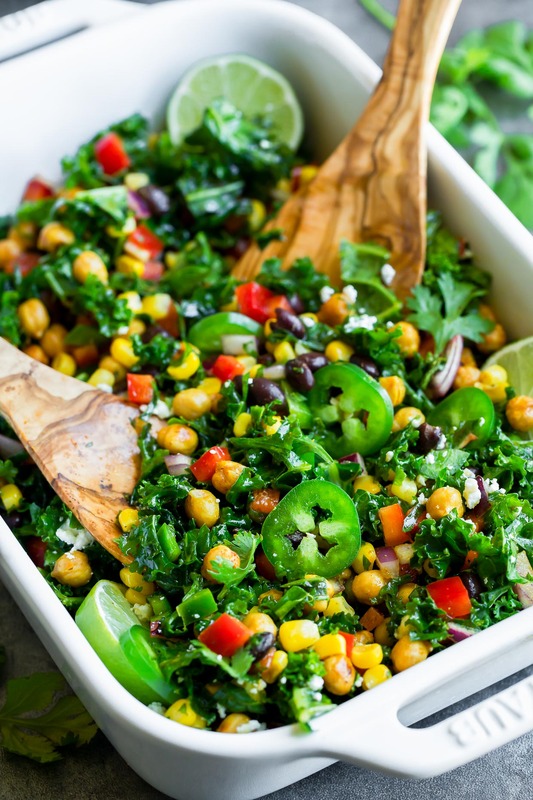 This healthy vegetarian salad will completely change your mind about kale forever thanks to its colorful veggie counterparts, crispy seasoned chickpeas, and crazy easy Zesty Cilantro Lime Dressing. SO. FLIPPING. GOOD. After the complete and utter debauchery that went down I yesterday, I’m pretty sure I owe y’all some greens. If this isn’t your first kale rodeo you already know the amazingness you’re in store for today. If you’re new to kale you’re pretty much going to happy dance around your kitchen because I’m about to CHANGE YOUR LIFE. I’m a wee dramatic, eh? Kale makes me crazy. You’re welcome for not spelling it krazy. This Mexican Kale Salad tastes like it came fresh out of a fancy Tex-Mex restaurant. I’m going to insist you make it. It’s that good! It has a welcome little kick of heat from the jalapeños and the crispy cayenne spiked chickpeas that I absolutely adore. 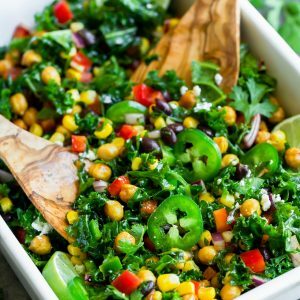 Once you toss the chickpeas in with the salad and dressing all the flavors from the individual ingredients do a little dance, make a little love, and get down with your taste buds! I swear I’m not normally this cheesy. Recipe yields two large meal-sized salads or 4-6 side salads. Since we can get all our prep work done while the chickpeas roast, this protein-packed salad takes only 25 minutes start to finish. SCORE! First up, let's crisp up those chickpeas! Drain, rinse, and blot dry with a few paper towels. 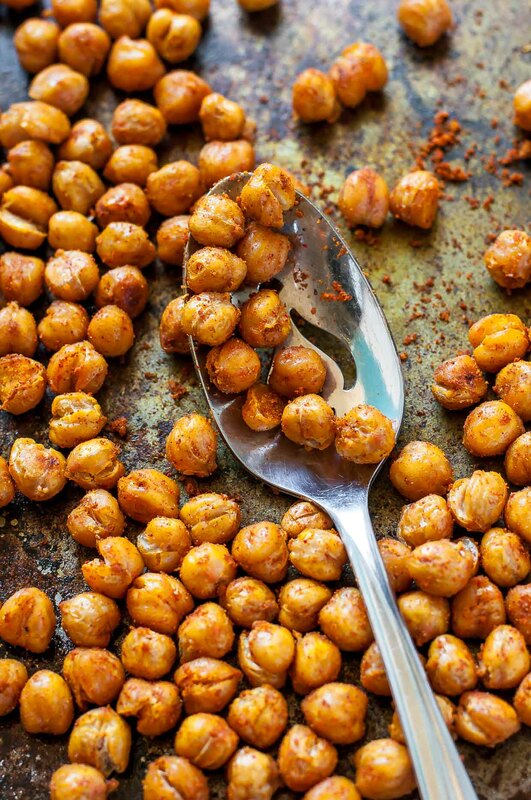 Toss the chickpeas with olive/avocado oil and salt until lighlty coated, then arrange in an even layer on a baking sheet. Roast on the center rack for 20-25 minutes until crispy on the outside and soft in the middle. While they're still hot from the oven, add to a bowl with your spices and mix well. While the chickpeas are roasting, let's whip up the salad and dressing! For the cilantro lime vinaigrette, combine all the above ingredients in a small mason jar and shake well. Add to a large bowl and drizzle kale with olive oil and a pinch of salt. Massage with your fingers until kale darkens in color and takes on a velvety texture. This little rubdown turns the kale into a tender and delicious salad green! Dice your onion, bell pepper, and jalapeño, removing the seeds/stems. I like to mince half the jalapeno and then slice the rest for topping the salad. Add to your kale along with the black beans. Shake (or whisk) dressing once more and pour over the salad. Toss to coat. Add chickpeas, optional cheese (it's great both ways!) and a little extra fresh cilantro if you'd like! Toss together and dig in! VEGAN SWAPS: skip the cotija/feta cheese (it's totally optional anyways) and using sugar or maple syrup in place of the honey. Easy peasy! The cayenne pepper and jalapeño peppers control the heat of this salad so use a little less (or skip) for a mild salad. As written, I feel like the salad had a nice punch of flavor and spice without being too spicy! Nutrition Facts are an estimate gathered using an online recipe nutrition calculator. Values for salad and chickpeas before dressing is added to taste. Adjust as needed. I’m completely bonkers for this Mexican Kale Salad. If you get a chance to try it, let me know! Leave some love in the comment form below or tag your photos with @peasandcrayons on Instagram so I can happy dance over your creation! I don’t really like Kale, but this salad is bomb. It was so tasty, can’t even taste any bitter Kale flavor. Sue, I’m so excited you gave kale a chance and enjoyed the salad! Thank you! Can we pin, your recipes, to our Pinterest. Yes thank you so much Rhonda! My images all have a “click to pin” feature with a little pink Pinterest button when you over your mouse over the images. I appreciate the sharing, thank you! What a delicious and beautiful salad. I have made it twice and it has been well received by all who ate it. It is my new favorite summer salad. Woot! 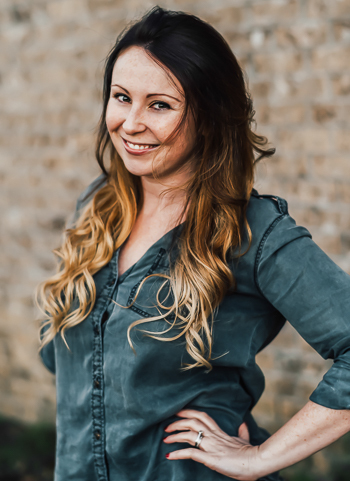 So stoked it made repeat status – thanks Karen! Soooo good. I added jicama and radishes. Will totally be adding this to my salad mix. Thanks! LOVE the addition of radish and jicama!! Thanks Liz! Lovey, just lovely ! And I am thinking about how ideal it is for my office lunches ! Thank you ! Thank you!! It’s so beyond portable it would be perfect for work lunches!